Are Backlinks Still Relevant For High Google Rankings? The heady days of the trusty shortcut to higher search rankings is coming to an end. A study from eConsultancy has revealed that even though backlink features have a pretty high correlation with rankings, their value is decreasing and this trend is set to continue. Instead the emphasis, increasingly, is on producing useful, valuable content for your users. The internet is ridiculously crowded with information, and this will continue to happen whether you like it or not, so why people should listen to you over everyone else? Influencer marketing currently trumps organic search, organic search and even paid search so if you’re not doing it, you’re losing out in a big way. In an ideal world your perfect influencer would have gold stars for each, and in an even better world wouldn’t come with a massive price tag. But it’s not a perfect world. Don’t pick anyone who’s influence you wouldn’t take yourself. And don’t go into this like it’s some business one night stand. You’re looking to build a relationship here, and in any stable relationship people need to mutually benefit from each other. So make sure you’re giving back in some way – ask yourself what you can do for them before doing anything. 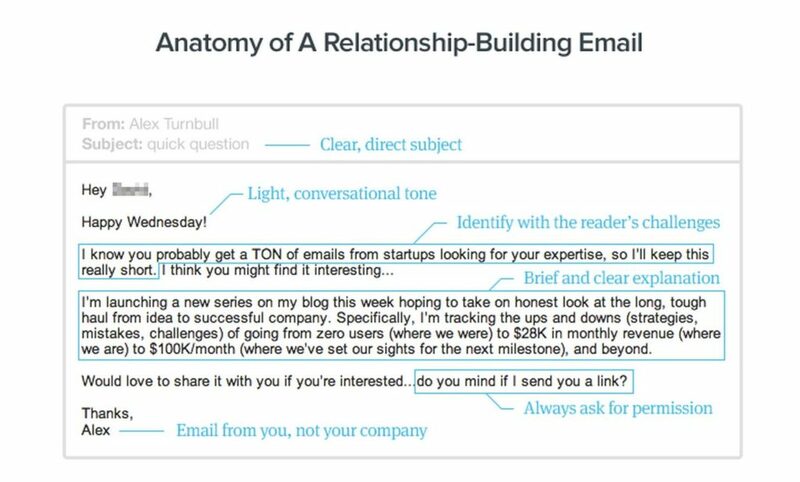 See below a satisfyingly simple diagram on writing a relationship building email along with a few other useful tips. In the eCommerce playground there’s one big kid you wouldn’t stand a chance beating in an arm wrestle, that big bad bully Amazon. ‘What have they done now?’ I head you say… Dynamic pricing, and it’s going down a storm. 1. Keep your eye on the ball when it comes to products. Being aware of what’s happening is your sure fire way to keeping your product breadth wide and attractive. 2. You’re aware, what now? Note how much they’re pricing them at. If you can’t sell what they are competitively, don’t stock it. Simple. 3. Don’t just store it, use it. What can you deduct from your data? Think of how you can differentiate yourself from your competitors and base your pricing strategy on it. 4. You don’t need to babysit your prices. By setting up dynamic pricing rules your prices can change in response to other factors. A machine learning algorithm can note what worked well for you and alter the algorithm accordingly. 5. Analyse and forecast. Repricers offer reports on how your pricing strategy went, so use it to decide if it’s working out or not. Like A/B testing, but for pricing. You can be the new kid on the block, you just need to start training. Customers are definitely willing to spend money but unfortunately they don’t just want to spend it with you. They’re jumping from company on and offline, so you better give them something worth coming back for. Although exclusivity is normally reserved for loyal customers, you can utilise it as a way to re-engage new ones. You can send out some info on a new product to someone who may have bought from you a year ago to remind them about you, or maybe even to compliment their last purchase. Buzzwords and phrases like ‘secret’, ‘just for you’ and ‘exclusive’ establish that brand customer connection well. We spend more of our time in our inboxes deleting spam and for some absurd reason ignoring all the overseas investors who want to send us their millions. Shame. But every now and then we’ll open up an email from a site we purchase from and actually give it a read. So there’s a holiday coming up and it’s your time to cash in. Remind your customer that it’s coming up for a start. In the body of the email, remind them what you have or offer in anticipation that they’ll find it useful when the time comes. something you can send to those who’ve purchased from you once before, but not for a while. Let them know you’re still there if they need anything, and if you must put in automatic product displays, pay attention to the circumstances of their last visit to you. Don’t recommend purchasing things they’ve already bought and remember small details like seasonality. They won’t need patio furniture in the winter. My favourite. Using phrases like ‘Hey, remember me?’ or ‘I’m still here!’ serve as a reminder for forgotten carts. Adding in a countdown or deadline will make the consumer feel like they’re missing out if they don’t purchase, and encourage them to come back to their cart faster. A study by Vouchercodes.co.uk suggests that 71% of consumers will turn to the internet this Christmas in the hopes of spending less this year than last. The increase of mobile and online shopping is still on a rapid upswing which will provide solace for those of you who want to avoid screaming children and stifling queues like the plague. Pique the interest of the 47% of shoppers who haven’t gone online to buy their food in the last year by allowing them to make the most of new devices, lower delivery charges and minimum spends and greater access to click and collect. Using the audience analytics tools is like stalking your prey. Use sessions, users, new visitors and returning visitors to note key strengths and weaknesses. For example, if a particular blog post were to have a large amount of returning visitors, it’s a safe bet that page has nailed it and others should follow suit for hopefully the same results. Traffic medium tools will help you figure out how these people have managed to enter your territory. Tracking organic, paid, search, referral, email, social and direct traffic will show you what paves the way to your website. This will give you the opportunity to promote the better performing channels for future campaigns. Lastly the performance metrics allow you to evaluate each page on your website on a micro scale. Page views, average time on page, bounce rate and exit rate can be used to determine whether your on-page content is influencing how people are moving to and from pages and whether you can alter this by altering the pages content. Do Security Indicators Increase Conversions? 77% of website visitors worry that their personal data could be intercepted or misused. That’s a lot of paranoid people. Keep these people in mind and use SSL. Trust seals are also a sure fire way of easing anxiety when people are paying online but use them sparingly – too much and it might ring alarm bells in your customer’s mind. We have an article which has everything you need to inspire consumer confidence on your website. Visa have announced that their Visa Token Service will replace sensitive information technology with unique digital identifiers instead. It won’t only be used at the check out, but on “cards-on-file” to facilitate repeat payments such as monthly prescriptions. Merchants and issuers have shown positive response and will provide safe and simple payments in just a few clicks. Now that’s what I call secure. There were many puns considered for this part, but we’ll save you the painful groan and get down to the basics. Waitrose are looking to cash in on the £4.5bn kitchen market with its new cookware website; currently offering shoppers more than 3000 products.